A balanced diet is important for your energy and overall well-being. This nutrition plan is set to give you an energy-boost and for you to feel good about the way you eat. Simple and tasty. It will inspire you to try new recipes and hopefully also make you feel different, healthier. 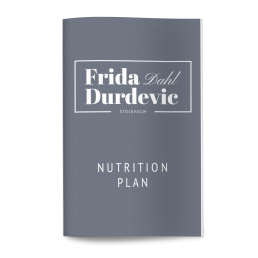 You get a complete diet plan with specific and clear guidelines on how to succeed. All recipes exclude sugar, gluten and dairy. The goal of this diet is to give you extra energy and power in everyday life, to give you the ability practice freely without gastrointestinal problems, avoiding energy dips and continuing to feel good (or even feel even better). It also provides a way into a healthy lifestyle – a new lifestyle for many of my clients, where both the stomach and the mind feel good!